Herbert Eugene Ives was a Physicist at Bell Laboratories (1925-1947). Other institutional affiliations included Western Electric Company and United Gas Improvement Company. His research interests included optical physics and television. July 31, 1882Birth, Philadelphia (Pa.). 1905Obtained BS, University of Pennsylvania, Philadelphia (Pa.). 1908Obtained PhD in Physics, Johns Hopkins University, Baltimore (Md.). 1908 – 1909Assistant Physicist, National Bureau of Standards. 1909 – 1912Physicist, National Electric Lamp Association. 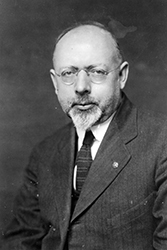 1912 – 1918Physicist, United Gas Improvement Company, Philadelphia (Pa.). 1919 – 1925Physicist, Engineering Division, Western Electric Company, Murray Hill (N.J.). 1925 – 1947Physicist, Bell Telephone Laboratories, Murray Hill (N.J.). 1933Member, National Academy of Sciences. November 13, 1953Death, Montclair (N.J.). Obtained PhD in Physics (1908). Frederic Eugene Ives and Herbert Eugene Ives papers, 1869-1957. Francis Gladheim Pease addenda, 1908-2001 (bulk 1908-1937). Measurement of radiant energy, ed. by W.E. Forsythe ... Contributors: Charles G. Abbot, Elliot Q. Adams, Loyal B. Aldrich [and others] ... Prepared under the direction of A.C. Hardy, Herbert E. Ives and W.E. Forsythe constituting a Committee on methods of measurement of radiation of the Division of physical sciences, National research council. Herbert E. Ives Physics Today obituary.